One of the many things that I find rewarding about reading food blogs is getting new ideas for things to try in the kitchen. Sometimes, it's learning about a food ingredient with which I was previously unfamiliar; other times, it's getting inspiration to cook a particular dish. And once in a while, it's both. Such was the case with the latest obsession in which I have been indulging - tomato soup. It all started back in August, when Pim - of the popular blog Chez Pim - posted an entry describing the dry-farmed "Early Girl" tomatoes that are grown by Dirty Girl Farm down in Santa Cruz. In her post, Pim raved that "you've never really had great tomatoes until you've had dry farmed tomatoes," and she also assured that these are "just about the sweetest and yummiest tomatoes you could find, beating your fancy heirloom tomatoes by at least a mile." Well, after reading a description like that, I obviously had no choice but to seek out these tomatoes on my very next visit to the Ferry Building Farmers' Market. And let me tell you, was Pim ever right. Early Girls are grown with less water, so they are smaller and much more flavorful than your garden variety and have an unparalleled natural sweetness. To put it simply, I had never tasted a better tomato. In the ensuing weeks, I became a weekly visitor at the Dirty Girl stall and found myself taking home one bag of Early Girls after another. Occasionally, I would eat them with fresh mozzarella from Cowgirl Creamery, olive oil from McEvoy Ranch, and fresh basil; alternatively, I would combine them with crisp cucumbers, slivered red onions, olive oil, oregano and feta cheese to make a Greek salad. 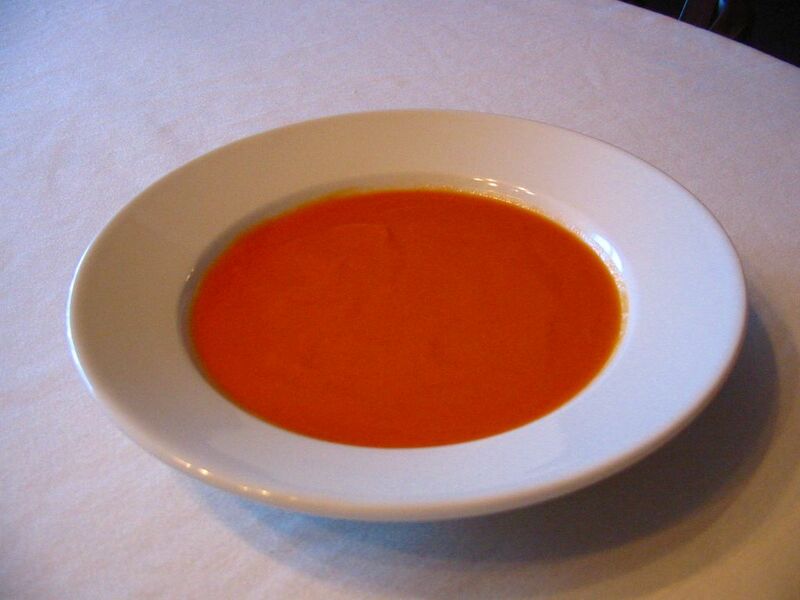 But in early September, one of my favorite food bloggers - Fatemeh at Gastronomie - posted about what she referred to as her "Tomato Soup Revelation." The recipe that Fatemeh included in that post is an excellent one that I fully intend to try, but what it immediately reminded me of was my favorite tomato soup of all time: the one served at Yountville's Bistro Jeanty. The first time I tried the tomato soup of Executive Chef Philippe Jeanty, I was momentarily left speechless. The characteristically sweet, slightly acidic taste of fresh tomatoes explodes on your palate, yet the flavor is also sumptuously smooth and infinitely rich as a result of the perfect amount of cream. A single spoonful was more than enough to purge the name "Campbell's" from my memory forever. It didn't take long for me to get online to search for the recipe, and it took even less time to find one that purports to be from Chef Jeanty himself. And although I cannot confirm the actual provenance of this recipe, I can tell you that it is one that I have used several times to produce a reasonable facsimile of the version served in the restaurant. Now, the recipe as written calls for ordinary tomatoes, which is precisely how I have always made it. But what would happen, I wondered after reading Pim's and Fatemeh's posts, if I used Early Girl tomatoes instead? Well, suffice it to say that ever since my first attempt to answer that question about a month ago, I have been converting pound after pound of Early Girls into batches of this delicious soup! One of the things that I like about this recipe is that it calls for absolutely no broth or water, instead drawing all of its flavor from unadulterated tomatoes stewed slowly with onion, garlic, thyme and bay leaf. And while it's true that some cream gets added at the very end, it tends to smooth out the flavors more than dilute them. I'm not sure how much longer Early Girls will be around, but I strongly encourage you to get some if you can and try this soup. And even if you are not able to get dry-farmed tomatoes, this recipe yields excellent results as long as you start with any decent tomato. 1. Melt butter in a large pot over medium heat, and the add onions. Cook until soft and translucent, about 5 minutes. 2. Add tomatoes, garlic cloves, bay leaves and thyme. Stir well, and reduce heat to low - cooking mixture slowly and uncovered for 1.5 hours. (The mixture should sit at a low simmer.) Stir periodically. 3. Remove from heat. Discard bay leaves, and run tomato mixture through a food processor or blender - working in batches if necessary. 4. Strain soup through a chinois or other large-volume fine-mesh strainer - working in batches if needed. The soup at this point will still be quite thick, so it may not readily pass through the strainer unaided. A technique that I have found particularly effective is to use a hand blender, submerging it into the soup as it sits in the strainer and pulverizing the ingredients even more finely to allow them to pass through. 5. Place strained soup in a large pot over low heat. 6. Stir in cream, and then add salt and white pepper to taste. Serves 4-6. If you wish to make the soup well in advance of serving, I suggest performing steps 1-4 (up to 1 day in advance) and then refrigerating the strained mixture. Then, shortly before serving, complete by performing steps 5-6. Similarly, if you want to freeze the soup, you will likely get the best results if you freeze after step 4 and then add the cream after thawing and reheating. Mmmmmm... Another one to try! Incidentally, Joe thinks he'll have the Early Girls until November, so long as we don't have a hard rain. We didn't have a hard rain, but it did rain overnight this weekend here in Santa Cruz. The weather quickly reverted to its previous Indian summer glory, and it's quite warm today. I hope that bodes well for the tomatoes. Incidentally, Ron Garthwaite (of Claravale Dairy Farm, the only raw, organic milk dairy in California) thinks dry-farmed tomatoes have thicker skins than tomatoes should. I hadn't thought of it, but I think he's right. So they're great for cooking, but for slicing tomatoes, I'll take a juicy heirloom any day. Happy Boy Farms has a great variety, but I don't know if you have them at your SF markets. I know they do upwards of 50 markets a week, though. See if you can find a tomato called Oxnard Orange (I think). It's school bus yellow, and it was my favorite discovery of last year. I'll be blogging soon about a friend who grew 145 kinds of tomatoes this year. Yowsah! Tana - I LOVE Happy Boy; they are one of my favorite stands at Jack London, because they almost always have peppercress, which is my favorite salad green EVER. I'll look for Oxnards on Sunday, thanks! Sam: In my book, Philippe Jeanty will forever be a genius for coming up with this soup (and for his incredible coq au vin)! Fatemeh: Thanks for the information about the Early Girls being around (hopefully) until early November. I guess I better block off my weekends between now and then and set up a tomato soup production line in my kitchen! And thank you for the post that inspired this one! Tana: Although the Early Girls clearly do have thicker skins than other tomatoes, it really doesn't bother me - even when I'm eating them plain in salads. I guess whatever preference I might have for a slightly thinner skin is more than offset by the spectacular flavor that the Early Girls offer. But maybe that's just me! Thanks for the information on the Oxnard Orange tomatoes - I will definitely check them out! Ummm, yummy. I've become a big soup fan in the last year and must put this on the list to try...soon. And I agree, NS, Jeanty is a GENIUS. If I'm in Yountville, that's where I eat. Period. Never yet been to Bouchon; I mean, why bother? Catherine: I agree with you completely. I have been to Bouchon, and I would still pick Bistro Jeanty! Butter? The rest of the recipe sounds great but butter in tomato soup doesn't sound quite right to me. Leon: I have found very few ingredients in this world that are not enhanced by butter! I have made this recipe as specified many times over the years, but I'm sure that you could substitute olive oil for the butter and get equally delicious results.